Plastic soup refers to the immense quantities of plastic drifting in superficial layers of the oceans. Areas where plastic soup accumulates and circulates in large circles are the gyri. Gyri are slow currents driven mostly by Westerly winds and influenced by the Coriolis effect causing a bend of 20-45° to the right, on the northern hemisphere. On the southern hemisphere the gyre moves counter clockwise. 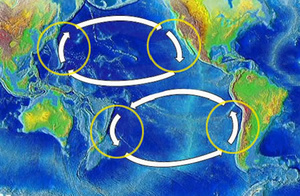 There are two notorious gyri in the Pacific: the North Pacific Gyre and South Pacific Gyre (see picture above). The North Pacific Gyre is also known as the ‘great garbage patch’, because of its accumulation of large quantities of plastic. Its estimated to consist of 100.000 billion tons of garbage. Mostly larger pieces, but also smaller pieces. The smaller pieces pulverize under the influence of salt water and photo degradation, and enter the food chain of marine mammals, fishes, tortoises and the albatros. These high density particles are difficult to spot with the naked eye and can sink to lower layers of the oceans. A Dutch organization master minded by Boyan Slatan and several hydrodynamic engineers from the Technical University of Delft started an ambitious project to clean up the garbage patches. Basic elements are long distance barrier segments floating in the sea, and a central platform collecting the garbage. They focus on the North Pacific where about 1/3 of all oceanic plastic is concentrated in an area between Hawaii and California. The project has now entered a new testing stage. Engineers are currently installing a scale model of the Ocean Cleanup Array in an offshore basin at the world-renowned Maritime Research Institute Netherlands (MARIN).